Important Note if you have current Cougar concerns! 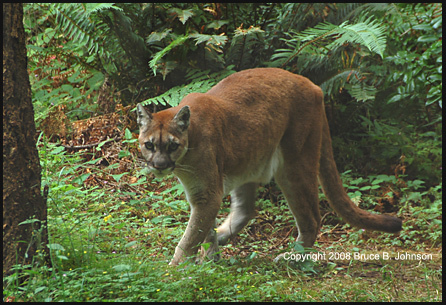 You ought to know that if you or your neighbors are worried about any cougar sightings in your area, Oregon policy states that ODFW will act rather decisively to protect you, your pets and your livestock--- but only if certain conditions are met. The phone number of the ODFW main office in Salem is: 503-947-6000, or 1-800-720-ODFW. Their address is 3406 Cherry Ave. NE, Salem, OR 97303. Email is odfw.info@state.or.us. The State of Washington is also very alert to protect you, especially after the Spring 2018 incident where a medium-size lion attacked two adult male mountain bikers, killing one and maiming the other. 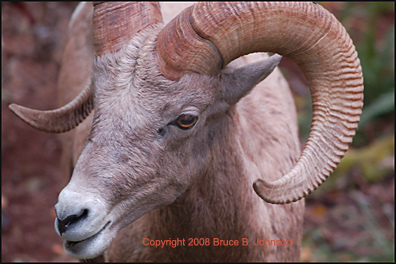 The Desert Bighorn Sheep was formerly found in abundance in the deserts of Southeastern Oregon, near Steens Mountain and the Nevada border. Click here for more coverage of their demise. 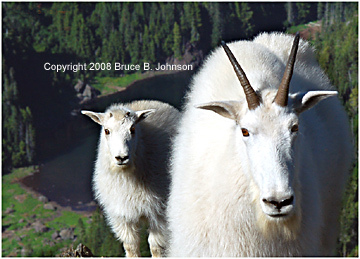 TThe Mountain Goat [Oreamnos americanus] is not to be confused with the Bighorn Sheep [Ovis canadensis] shown above. They are entirely different genus types. I photographed this mother-kid pairing near a 6,000 ft. peak high in the southeastern portion of the Olympic Mountains of Washington. The time was early September and this pair was cautious. I respected natural reserve by not moving any closer than what my 135 mm telephoto would get me, and by fading into the background at the first signs of unease by the animals. Big males (Billies) can weigh up to 300 pounds and can be dangerous if provoked. It is said that the baby goats can stand up 10 minutes after birth, and can jump within 30 minutes. 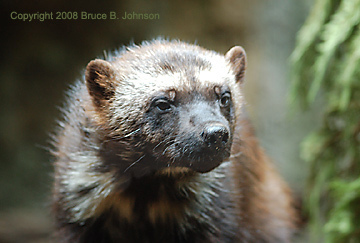 This helps protect them from their predators such as eagles, mountain lions, and wolves. 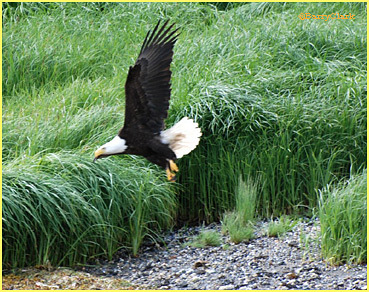 The Eagle Image below is contributed by my friend Barry Clark. I found its portrayal of the American Bald Eagle to be intriquing and unique, introducing a new perspective to the bird's life. I'd seen too many eagle pictures with certain visions, either "seeing" the eagle on the ground or flying high in the air. Barry's image suddenly crystallized that in-between world, the great bird skimming the Earth, about to grab prey, searching for a landing place, or maybe a mate. Your source for inspiring outdoor photography!